We’d love your help. Let us know what’s wrong with this preview of Gap Year Girl by Marianne C. Bohr. 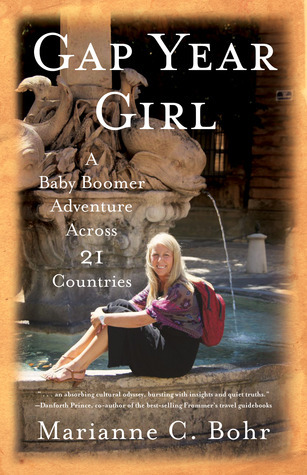 For every reader with wanderlust, and Baby Boomers longing to hit the road, "Gap Year Girl: A Baby Boomer Adventure Across 21 Countries" is a pleasure to read. "Gap Year Girl" is Marianne Bohr’s travel journal and memoir telling how she and her husband, Joe, retraced their the travels abroad in earlier years. Bohr describes what it’s like to kiss your job good-bye, sell yo For every reader with wanderlust, and Baby Boomers longing to hit the road, "Gap Year Girl: A Baby Boomer Adventure Across 21 Countries" is a pleasure to read. To ask other readers questions about Gap Year Girl, please sign up. I want to thank the author, Marianne Bohr, for this copy of Gap Year Girl, and Goodreads for making this opportunity possible through the First Reads program. An interesting read. Some of it I could relate to, as a 50+ year old taking time to do long distant (ie multi month) hikes of the Appalachian Trail and Pacific Crest Trail (http://www.trailjournals.com/Brakeman...) - the discovery that less is more; that to simplify life takes a huge load off one's shoulders; that partaking of an adventure I want to thank the author, Marianne Bohr, for this copy of Gap Year Girl, and Goodreads for making this opportunity possible through the First Reads program. For one who has endured a lifelong case of wanderlust, Gap Year Girl is as good as it gets. It’s hard to know which is more fun—vicariously traveling with Bohr and her husband as they visit such old familiar places as Paris, Rome and Istanbul, or tagging along as they stop over at towns and villages I’ve yet to see. Then, too, there are the ups and downs of travel. Sharing their anticipation, for instance, of a performance of Turandot in the ancient Roman theater at Orange, an hour’s drive north For one who has endured a lifelong case of wanderlust, Gap Year Girl is as good as it gets. It’s hard to know which is more fun—vicariously traveling with Bohr and her husband as they visit such old familiar places as Paris, Rome and Istanbul, or tagging along as they stop over at towns and villages I’ve yet to see. Then, too, there are the ups and downs of travel. Sharing their anticipation, for instance, of a performance of Turandot in the ancient Roman theater at Orange, an hour’s drive north of Aix in the Rhone valley. Experiencing their disappointment of finding themselves in Saint Cirq off-season, when no one’s around, and there’s nothing to do. Enduring the frustration of arriving at the Hotel Lauberhorn in Switzerland under a cloud cover so thick as to make the mountains invisible, only to awake the following morning to a gleaming view of the north face of the snow-covered Eiger. Ultimately, Gap Year Girl is proof-positive that dreams come true. I loved this book. It's a great story of adventure and commitment to a life-long plan of travelling and living in Europe for a year with a man (her husband) who is just as committed to the plan as she is. It's such a brave thing to do and it's got me thinking that maybe I can too. Gap Year Girl took me two weeks to read. Not because I didn't want to finish it right away but because I wanted to follow her through some familiar places I've been to as well. Her descriptions of people and places wer I loved this book. It's a great story of adventure and commitment to a life-long plan of travelling and living in Europe for a year with a man (her husband) who is just as committed to the plan as she is. It's such a brave thing to do and it's got me thinking that maybe I can too. This was a fun book. I loved the non-traditionality of it all (I'm referring, of course, to the traditions of travel bloggers who leave on a life-changing journey at 22 and fall into a life of reviewing mediocre resorts until they fall offline in their mid-40s). Francophilia aside, Marianne and Joe were fun to follow on their journeys. Unlike many travel writers, Bohr confessed to having non-positive feelings on the road. I appreciated it throughout--she addressed bad days, changes of plans, and This was a fun book. I loved the non-traditionality of it all (I'm referring, of course, to the traditions of travel bloggers who leave on a life-changing journey at 22 and fall into a life of reviewing mediocre resorts until they fall offline in their mid-40s). Francophilia aside, Marianne and Joe were fun to follow on their journeys. Unlike many travel writers, Bohr confessed to having non-positive feelings on the road. I appreciated it throughout--she addressed bad days, changes of plans, and looming trepidation of her trip ending. I also enjoyed an entire chapter dedicated to pre-trip preparations. Although the premise of this book was interesting, I found the author was a bit sharp-toned and not really a world traveler as much as just knocking things off a bucket list. In particular, her section on Morocco was harsh and very ethnocentric. Lack of understanding of the cultures you encounter leads to unfair statements. I can't recommend this book as I think the author has much to learn about being a true world traveler. 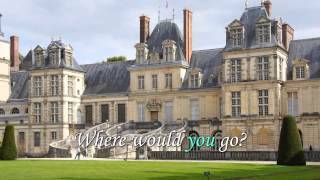 The author loves France and spends most of her time there. I wish I had known before i picked it up as I am not really interested in France. It seems like a nice country, but meh there are so many others. She did visit other countries, and notes them, but she compares them to France. Again, good book, but please move on from France. Jealous! Jealous! Jealous! It would be amazing to leave one's cares behind and explore new parts of the world for a year (or even just a few months). While I would not choose the same itinerary, there are many places they travel that I would like to visit. A strong point of the book is that she does not sugar-coat the experience. Along with all the wonderful things they see and do, she also discusses the unpleasant moments, including feeling homesick or depressed or feeling uncomfortable by their Jealous! Jealous! Jealous! It would be amazing to leave one's cares behind and explore new parts of the world for a year (or even just a few months). While I would not choose the same itinerary, there are many places they travel that I would like to visit. A strong point of the book is that she does not sugar-coat the experience. Along with all the wonderful things they see and do, she also discusses the unpleasant moments, including feeling homesick or depressed or feeling uncomfortable by their surroundings (their visit to Morocco was particularly tough). She shares the lessons they learn about themselves and what they need; although both introverts, they need other people around, if only for people watching. And as nice as it can be to leave technology behind for awhile, they need Internet access regularly to connect with family and the outside world. And at times they need simple acts of kindness, especially when in unfamiliar places and dealing with unexpected difficulties. It was neat that they spent Christmas week in London, because I did the same years ago. They definitely had the better Christmas Day/Christmas meal, but I think I had the better week. I was saddened that Vienna was underwhelming for them, because I loved the time I spent there. This book was a pleasure to read. Not only was the subject matter interesting, but the author has a writing style that is engaging and descriptive and leaves you wanting more. I would highly recommend this book. For the most part I really enjoyed the book. This is something I would love to do, but never will be able to. It is great that the author and her husband could live as locals during the trip at times. It was also good to hear the good and the bad about places. I really enjoyed the book until I hit the part about the Germanic countries. I was disappointed not reading impressions about Prague and Budapest, having been to both places myself and loving them. I was also extremely disappointed with t For the most part I really enjoyed the book. This is something I would love to do, but never will be able to. It is great that the author and her husband could live as locals during the trip at times. It was also good to hear the good and the bad about places. I really enjoyed the book until I hit the part about the Germanic countries. I was disappointed not reading impressions about Prague and Budapest, having been to both places myself and loving them. I was also extremely disappointed with the comments about Germany, not liking the language, food and finding the people brusque. Germany has many wonderful places to visit, some great food and some wonderful people -- just like France does (and I am encouraged by the author's comment that the French are more customer service oriented over the past 35 years, having had some extremely disappointing times there myself). I hope other readers won't feel that they shouldn't visit a wonderful country who has had its challenges, just like other countries in Europe. They might go down the Rhine and see the castles that were destroyed by the French in their many invasions. I won this book in a Goodreads.com giveaway. If you have ever wonder what is would be like to live in Europe for a year, then Marianne C. Bohr's book, "Gap Year Girl" is the book to read. Bohr takes you on a trip across 21 countries, along with her husband Joe, and shares with you their adventures. Beautifully written, Bohr gives you the opportunity to imagine the wonderful tastes from each of the countries of their visit; the countries demeanor and customs. Each chapter leaves you wanting more. No I won this book in a Goodreads.com giveaway. Each chapter leaves you wanting more. Not only more of the story, but more of the wonderfully delicious antidotes of her and husband's journey into countries that they have never touched. She quotes Thoreau in the beginning of her book: "Go confidently in the direction of your dreams. Live the life you've imagined." And that she has done. A delightful and engaging read. Bohr's passionate prose clearly articulates her joy of travel - and readers are in for a wonderful and surprising journey. One cannot help but to live vicariously through her storytelling and vivid and nuanced descriptions of the bucolic settings along the way. An adventurous account of the highs (and lows) encountered on their journey that is relatable and pragmatic - a perfect blueprint for those with similar musings in mind. Enjoyed the style of writing. So many times throughout the book felt as though I wanted to experience all the adventures she and her husband were on. I appreciate that she was writing from her own personal experience, therefore I would not want her to change a thing. Enjoyed her perspective of her own experiences. That makes the book unique. Thank you Marianne, you have inspired me to venture out and find my own unique adventures. A great read for those of us with wander lust! I love her "real" narration of the trip. As we know , it isn't always rainbows and sunsets and she captures the ups and downs of traveling with candor and humor. To be honest, I ended up liking this book a whole more than I thought I would and I recommend without reservations. A brave idea and to pull it off with her husband and include her children at times - BRAVO! Loved her take on the places she'd been. Crossed Morocco off of my bucket list....added Greek isles....really surprised she didn't talk about Prague which is a fabulous place....of course France and Italy are amazing! This was a fun, honest, and inspiring read. I most appreciated Marianne's personal reflections on her reactions to the various people she met and places she explored. Marianne C. Bohr has been married for over 30 years to her high school sweetheart and travel partner, has a grown son and daughter and is the eldest of 11 children. She started her career working for the French National Railroad (the SNCF) in New York, selling Eurail passes and mapping itineraries for American travelers to Europe. She has her MBA; was Senior Vice President of a book publishing and Marianne C. Bohr has been married for over 30 years to her high school sweetheart and travel partner, has a grown son and daughter and is the eldest of 11 children. She started her career working for the French National Railroad (the SNCF) in New York, selling Eurail passes and mapping itineraries for American travelers to Europe. She has her MBA; was Senior Vice President of a book publishing and distribution company; served on association boards; traveled across the US many times a month on business; attended international book fairs and taught national workshops every year; handled multi-million dollar budgets; ran sales conferences; and, managed a large staff.